A few days back I did my first Cask event with a friend and fellow Brew-master student Jeff. The whole experience was extremely fun, a little nerve racking and turned out really well (Thankfully!). We brewed a batch of base Saison a over a month before the event as we had to let the beer ferment for 2-3 Weeks and then rack it in to the Cask where we added a few kilograms of sour cherries and let the flavors mingle. I must say I was worried we would end up with an under-carbonated cask and we definitely didn't, It was in fact over-carbonated! The exciting part was when we finally tapped it, and the tap was broken! We ended up changing to a new tap, that believe it or not was also broken. The 3rd tap was the charm. Below are a few pictures of me and Jeff with the Cask. Had an amazing time at the cask event that @richbrews and I brewed. Thanks to everyone that came out and supported us! The beer also came out a wonderful pink color and a little tart due to the Sour Cherries. Overall a wonderful sucess and I hope to do more Casks in the future! So I (And most of my class in the Brewmaster program at Olds) went down to Yakima for a 'school trip' which I must say was the best school trip I've certainly ever taken. It felt more like an educational pub crawl. We stopped along the way at a fantastic array of breweries, a cidery, a winery, a couple of distillery's and some hop farms / processing plants. I found the trip to be eye opening as to how much I want to be in this industry, and really gets me excited for the course. Everywhere we visited we met friendly and genuine people. Thanks everyone that hosted us! I've been in the course now for only about a week, and already feel I've learnt so much information I never even imagined I'd need to know. I'm amazed at the layout, climate and area of the world that hops thrive in. The process of picking the hops and removing them from their bines. 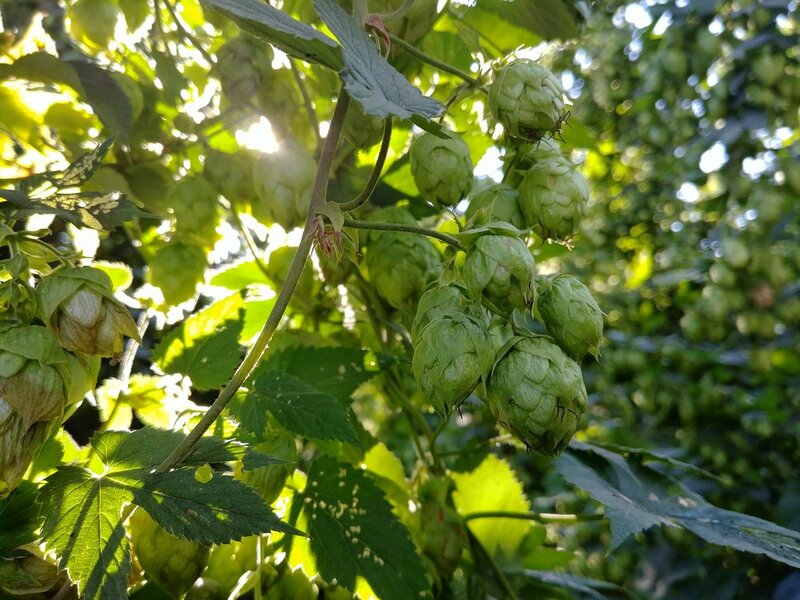 And the way they are then dried and either used as whole cones, or pelletized into a much less perishable medium - or even in some cases used as hop extracts. I'll post a few images of the trip below with some explanations of where and when they were taken for context. After they are picked, separated they get dried to stop them losing flavours. The smell inside this room was amazing! Finally the hops are bailed, this was taken at Virgil Gamache Farms. couldn't help giving them a Hug!